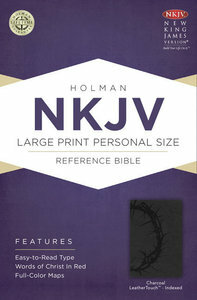 About "NKJV Large Print Personal Size Reference Indexed Bible Charcoal"
Easy to read and carry, the NKJV Large Print Personal Size Reference Bible features many of the same helps as other editions twice its size, including 12-point type, a large print concordance, eight four-color maps, presentation page, the words of Christ in red, 52-week reading plan, and more. 0 Available. Expected to ship June 2019.